Long ago, it is told, a powerful wizard brought forth a collection of fantastic islands now known as the Miraclea Archipelago. To this day, the tradition-steeped Miraclea Academy For Wizardly Thought continues its study of these islands. However, a troubling report has come in from one of the islands, Hidlyda, concerning a sudden increase in the number of monsters. It appears that the terrible king Yeah Walusa has infiltrated the island! To investigate the island, and hopefully defeat the evil king, the Academy has chosen apprentice witch Polfe Hydla. Why, you ask, would they choose a practically powerless novice for such a dangerous mission? The ancient traditions of the Academy must be upheld, no matter the cost! Guide Polfe in her quest to gather the legendary Philosopher’s Pebbles of the isle of Hidlyda and end the evil king’s ambition once and for all! 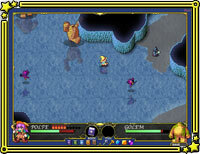 Control Polfe as she attempts to solve the mysteries of the island and defeat the evil king Yeah Walusa, who lurks deep beneath the surface. 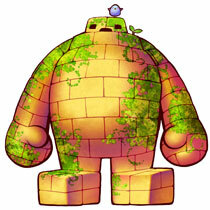 Fortunately, the legends speak of many treasures hidden on the island that will aid you on your quest. Collect them to power up and make it easier to dispatch enemies. 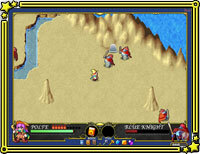 In the treasure chests you will find Tomes that can give Polfe access to more powerful magic. Each magical attack works differently and is tied to an element such as fire or ice. Some monsters are weak to certain elements, so it’s wise to determine your enemy’s weakness and choose your magic accordingly. You will encounter obstacles blocking your path that can be destroyed using magic, as well as hidden treasure chests that only appear when you fulfill certain conditions. There are some puzzles you will have to solve in order to make it to the lair of the evil king. A first-year student at the Miraclea Academy for Wizardly Thought. As a freshman, the only broomstick she’s allowed to use is the one that carries her to the island, and the only spell she’s been taught is the Magic Ball, which everyone knows is for babies. But while others in her shoes might be annoyed, she honestly hasn’t given it much thought. A weak monster that slurps over the fields. Its movement is slow. A monster that prowls the thickets. If it spies Polfe, it rushes at her swinging a spiked club. 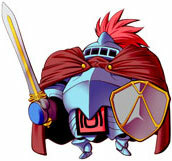 A knight in armor who wields a giant weapon. It moves slowly, maybe because of all that armor. Its attack is fearsome, though. This servant to the evil king wields dark magic. It will attack Polfe from a distance, and it can’t be hurt by low-level magic. 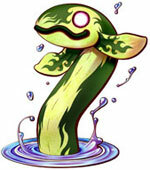 Sticks its neck out above the water and fires poison bubbles at you. It’s really best just to run away. An octopus monster. It moves slowly, but it’s strong and tough to defeat. A demon in service to the dark king. 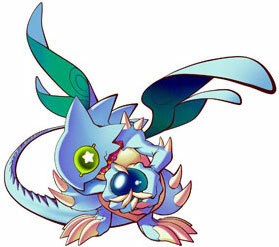 Its body may be small, but it casts magic and wields a spear, making it a formidable foe. A powerful monster lurking deep within a cave. If it sees Polfe, it flies into a rage and attacks! A dragon that protects the evil king’s castle. It appears to be sleeping, but how are you supposed to get to it? Click the Start Button on the title screen to start the game. If you saved in the middle of a game, the Continue Button will appear. Click this to start from the map of your last save. There are two modes of controlling Polfe: Manual Mode and Auto Mode. You can switch between modes by pressing the Space bar. Polfe will automatically move towards the cursor. Hold down the left mouse button to move towards the cursor. 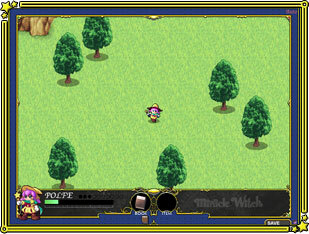 Polfe’s walking speed will change depending on how far she is from the mouse cursor. She’ll stop moving if the cursor is right next to her or if it moves above the blue screen border. If your magic hits an enemy, it will take damage. If its health drops to zero, the enemy is defeated. Your magic shots will also open treasure chests. To change spells, click the Tome you want in the Magic List. The active Tome will be replaced by the Tome you selected, and you can then use the new Tome’s magic. In the same way, you can change the active item by clicking on a new item in the Item List. You can power-up Polfe using items and Tomes you find throughout the stages. Picking up new equipment will change the Equipment graphic and give you the new equipment’s status effect. Picking up a Tome will add new magic to your Magic List, while picking up an item will add it to your Item List. Stand still to regenerate health. There is also medicine you can find that will raise your maximum health. When you defeat an enemy, once in a while it will leave behind a red jewel called a Magic Stone, which you can pick up to add 1 to your Magic Power. The higher your Magic Power, the more powerful your magic. However, if you take damage, your Magic Power will drop by 1. There is an upper limit to your Magic Power, but certain types of equipment can raise your maximum or minimum Magic Power. Handy! Running into enemies or getting hit by their attacks will damage you and lower your health. If your health drops to zero, the game is over. To save your game progress, click on the Save Button in the upper-right corner. After saving, you will be blocked from saving again for 5 seconds. When you continue, you will start from the spot where you entered the current map, with all items and health stats that you had when you saved. The tiny round button to the right of the Save Button is the Reset Button. Clicking this will return you back to the title screen. Polfe is controlled with the mouse. 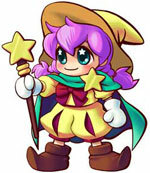 Holding the mouse button moves her, while clicking it fires your magic. 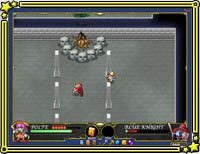 Before you get accustomed to the controls, it may be easy to accidentally run towards an enemy when you meant to attack it. The trick is not to get too close to the enemies. If you wind up too close, rather than trying to attack, it’s safer to run away and attempt your approach again. 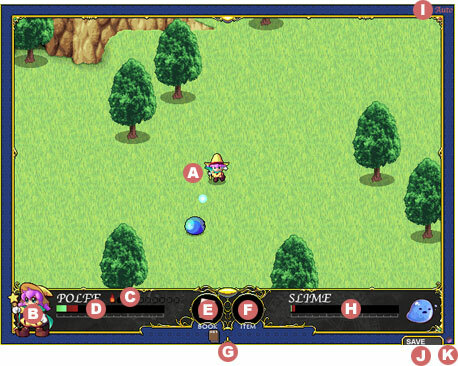 In the same spirit, you have to click the Tome icon at the bottom of the screen to switch spells, so rather than trying to switch in the heat of battle when you’re surrounded by monsters, a more prudent approach is to identify the monster’s weakness and switch to the appropriate spell before you begin your attack. A weak spell with which Polfe starts the game. Can fire a turbo-shot. A spell that conjures flames. 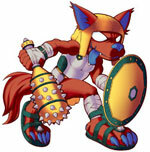 It only affects nearby enemies, but its constant stream of fire can come in handy. A spell that shoots giant blocks of ice. There are lots of monsters for whom ice is Bad Times, so this is nice to have. You can’t use a turbo-shot with this, but you won’t be worrying about that when you’re unleashing lightning to zap your foes from afar. The key that opens the tower door. The key that opens the door to the dark king’s castle. A mysterious item found somewhere on the island. It shines and sparkles… but it’s just a rock. This glove raises your Magic Power considerably. Its magical power extends the length of your invincibility after taking damage. Lowers the amount of damage you take. Their magical power will not only lower the amount of damage you take, but also increase your healing power. Allow you to run faster.